This standard specifies the mapping of DV-DIF (digital interface format) data to an MXF generic container, which is suitable for the application of all variants of the DV specifications as defined by IEC61834-2, SMPTE 314M and SMPTE 370M. This standard defines a SMPTE Universal Label that can be used to uniquely identify specific DV variants. The MXF specification is written in several parts. 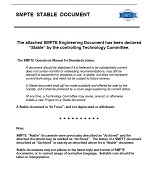 This is one of a set of documents that define the contents of the MXF file body. In order to achieve interoperability within any given operational pattern, restrictions may be placed on the way in which this generic container type can be implemented. The reader is advised to carefully study the appropriate operational pattern document before implementation.